Every three months, I try to reflect back on where we've been, where we are, and where I'd like to go. It's been a hectic 3 months with the arrival of a very special package, the kind that needs burping, diaper changes, and lots of hugs. That's right, I am the proud papa of a baby boy, and while he has greatly changed our sleeping schedule, I've been doing my best to keep the blog going strong (though I apologize for typos and any strange sounding posts, sometimes I try to squeeze in a post when I should be going to bed....kinda like right now). 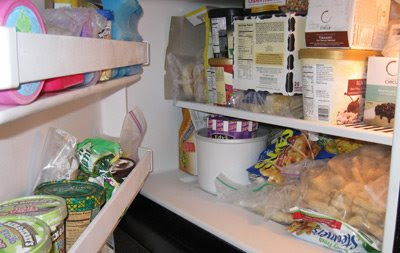 As you can see the freezer is kinda full, though technically it has been worse. Actually, we have decided to give in and buy ourselves a freezer for the basement. It will only have manual defrost, so there will be no more cycling of our poor ice cream stash. Plus, every now and then I will buy something and it gets lost in the freezer ...like a container of Sherbetter and a pint of Starbucks Hot Chocolate Ice cream ...and a pint of Limeilicious from the ice cream club. It will also be nice to put some dinner items in the freezer again (without having to shove them in). I love this blog, but it does take more time (and space) then you might think. The blog has grown a bit more, but to be honest, it seems like every day that I ask myself what I need to do to keep it growing. There are literally hundreds of hits between people leaving comments and sharing their opinion with us. So the question is: How do I make my postings compelling enough that you want to chime in and share your opinion. Yes, this blog is all about my opinion I hope we grow to the point we're people see a great new flavor, go out, try it, then come back and comment. That is and will continue to be my primary goal, the way I benchmark the success of the site. My secondary goal is ofcourse: free ice cream. I want to be in the loop, I want to know when new stuff is coming out, and best of all, I want to try it so I can tell you about it. Hopefully it will be a great new product (and so far, they usually are). I've been having a blast reviewing the new ice cream dessert from Culinary Circle. I hope you've enjoyed reading about them, seeing the pictures, and then being inspired to go try them. What else? well, I got excited when a couple of people signed up for the forum shortly after I released it. I thought "wow, just a couple people a day signing up and in no time we'll get a community started". well, i knew it wouldn't be that easy, but I still think everyone should sign up. I was hoping it would make it easier to have a back and forth discussion about various frozen treats. Ok, I should go to bed, it's been a long day (that included bending the blade on the lawnmower). Besides lost flavors in the freezer, I have lost posts in my head (including ice cream sandwiches, ice cream cupcakes, and an interesting ice cream flavor I made several weeks ago). As always, I welcome your thoughts and suggestions at onsecondscoop at gmail dot com. I could greatly use everyone's feedback on which way the blog should go: do I need more or better pictures? more in depth reviews? more comparisons? more data? Let me know and I'll do my best to take things up a notch. thanks everybody, have a great night!